Roasting stone fruits like Peaches, Nectarines and Plums intensifies their fabulous flavors and creates a natural, juicy sauce for the fruit. Candied walnuts add a bit of sweet crunch! In August and September, farmer’s markets and grocery stores are overflowing with fresh stone fruits like peaches, nectarines and plums. I’m always looking for new ways to prepare these delectable fruits and decided to try roasting them. 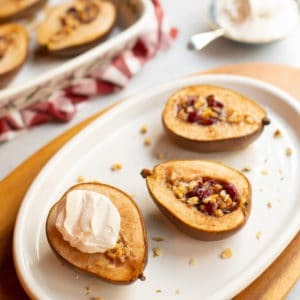 After peeling and slicing up a bunch, I tossed them with a mixture of brown sugar, white wine and cinnamon, and popped them in the oven (covered) to see what would happen. All I can say is, YUM! Adding candied walnuts on top when serving adds a bit of sweet crunch, and makes this dish sort of like a deconstructed – and gluten free! 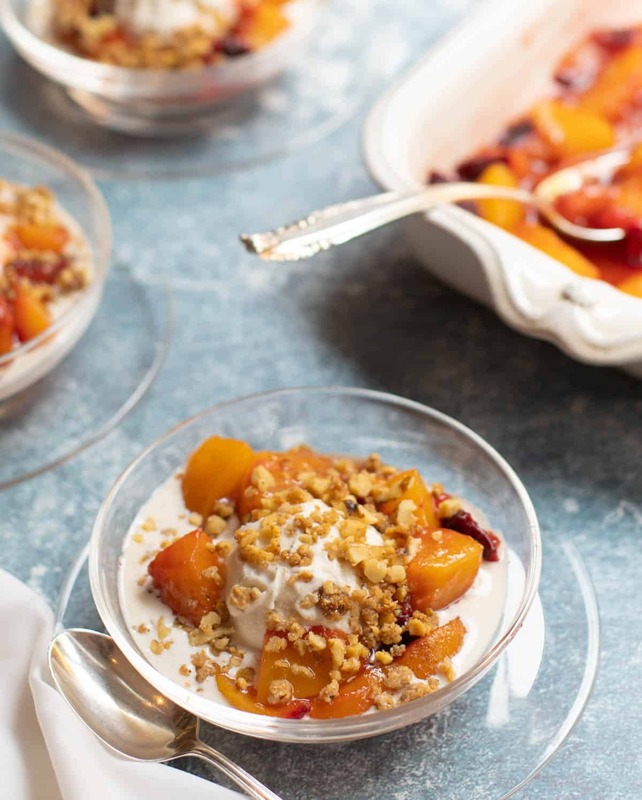 – fruit crisp. 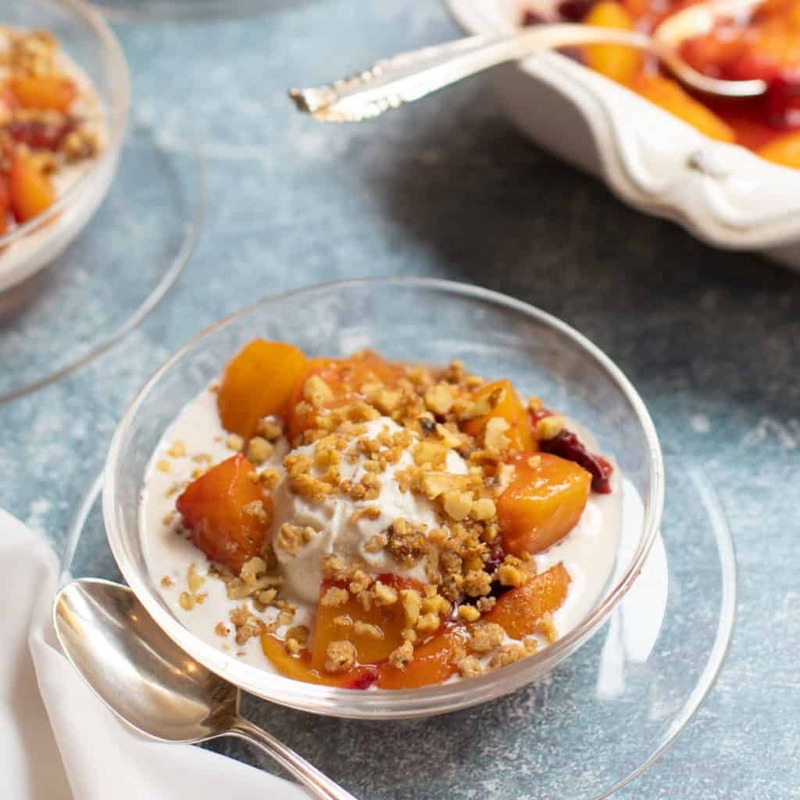 In terms of how to serve the Roasted Peaches, Nectarines and Plums, I like to spoon them (warm) over creamy vanilla ice cream and sprinkle the candied walnuts on top. 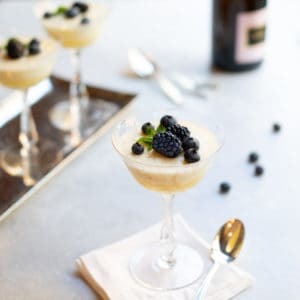 There are numerous other serving possibilities – try them with pound cake or short cake and whipped cream; with your favorite cheesecake; or even with the Barefoot Contessa’s Panna Cotta. Roasting stone fruits like Peaches, Nectarines and Plums intensifies their fabulous flavors and creates a natural, juicy sauce for the fruit. Candied walnuts add a bit of sweet crunch. In a large skillet, melt the butter over medium heat. Stir in the granulated sugar, then the chopped walnuts. Cook, stirring for 5 minutes, or until the sugar is melted and the nuts are starting to turn light brown. Remove from heat and quickly transfer nuts onto waxed paper, separating the walnuts as much as possible. Sprinkle lightly with kosher salt. Set aside to cool. Preheat oven to 400 degrees. Lightly butter a 9 by 12-inch baking dish. Peel the peaches and nectarines; cut into 1/2-inch slices. Cut larger pieces in half crosswise, if desired. Cut the plums into 1/2-inch slices. Place all three fruits in prepared baking dish and sprinkle lightly with lemon juice (you won’t need to use the entire half lemon). In a small mixing bowl, whisk together the brown sugar, white wine and cinnamon. Stir into fruit. Cover and bake for 15 minutes; uncover and stir. Recover and cook another 10 minutes or until bubbly hot. Place a scoop of ice cream in each of 6 to 8 bowls. 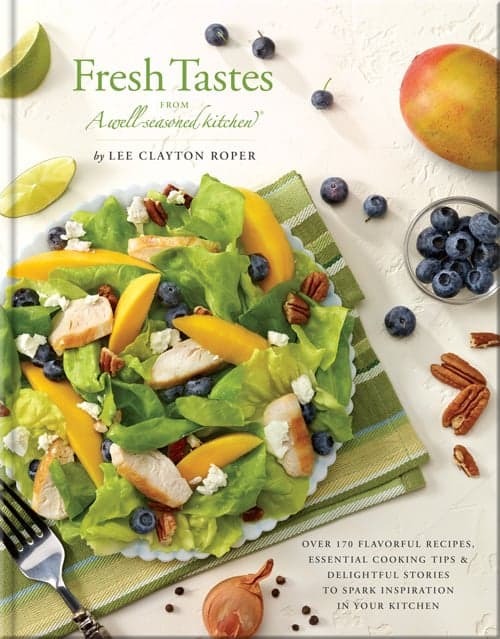 Top with warm fruit; sprinkle candied walnuts over the top. Make ahead: the candied walnuts can be made up to 2 days ahead and stored in a ziploc baggie at room temperature. The fruit can be cooked earlier in the day, covered and kept at room temperature. Warm until bubbly in a 350-degree oven before serving. 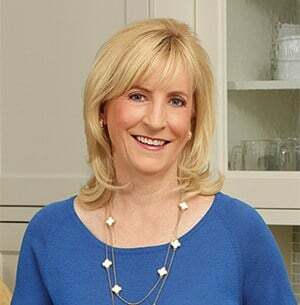 Note on wine: I find that an un-oaked and not too dry white wine works best in this recipe – e.g., a Sauvignon Blanc or Riesling.